Gun related violence has been on the rise in recent years. High profile shootings and other such events require prosecutors to take a hard-line stance against offenses involving firearms. This means that many prosecutors will aggressively pursue any crime involving a weapon. 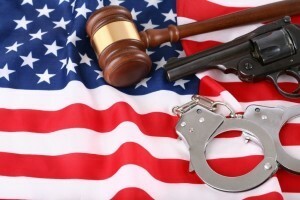 If you are a Phoenix, Arizona resident and find yourself facing gun charges then you need an attorney who will fight equally hard on your behalf. Bretton Barber understands the seriousness of such situations and gives these types of cases the attention and respect which they deserve. Contact our criminal defense lawyer today. Gun crimes often hinge on search and seizure issues. If the arresting officer found the weapon via an illegal search then it may be possible for your attorney to exclude the firearm from the court proceedings. It is crucial to your defense, therefore, to hire an attorney who is versed in search and seizure law. Doing so can make the difference between your case being dismissed and your going to prison. Bretton Barber is an aggressive Phoenix, Arizona defense attorney who protects the rights of the accused. He will quickly analyze the police reports, as well as other relevant evidence, in order to determine if your Fourth Amendment rights were violated when the firearm was found. If such is the case then he will file a Motion to Suppress Unlawfully Seized Evidence. The Court will hold an evidentiary hearing in regards to the Motion and the arresting officer will testify at this hearing. If this Motion is denied then he will explore other defenses as part of his trial strategy. This is a serious offense and you need a lawyer who will take the charge seriously. We also represent defendants in other Maricopa County cities such as Mesa, Glendale, Scottsdale, Chandler, and Gilbert. We also assist Pima County residents in Tucson. It is common for the state of Arizona to charge Phoenix residents with a gun-related charge if the firearm was used during the commission of another crime. The firearm will also lead to any other charges being elevated. Common examples include cases of aggravated robbery, felony domestic violence, and felony assault. Furthermore, carrying a firearm when one is a convicted felon can result in Federal criminal charges. If you have found yourself in such a situation then we are ready to assist you. Call our lawyer today.